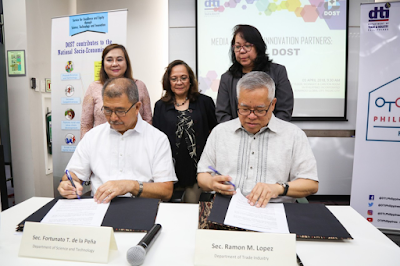 Department of Trade and Industry (DTI) Secretary Ramon M. Lopez and Department of Science and Technology (DOST) Secretary Fortunato T. de la Peña signed an MOU to promote Filipino innovation, or “Filipinovation,” for entrepreneurs. “Innovation is when you fix something, even if it’s not broken. In entrepreneurship, continuous innovation in products, processes, business model, is the only way to survive,” said Secretary Lopez. “Through the MOU, DTI and DOST will merge One Town One Product (OTOP) and Go Lokal entrepreneurs with DOST’s oneSTore.PH hubs. ‘OTOPrepreneurs’ may now also use DOST’s online store, oneSTore.PH, to sell their products”, Sec. de la Peña said. Meanwhile, DOST will also provide selected Negosyo Centers with S&T Nooks for those who want to access DOST’s resources but don’t have internet connection. MSMEs comprise 99.6% of enterprises and 70% of employment in the country, but only account for 35% - 40% of Gross Value Added contribution to the economy. Sec. Lopez said innovation can bridge this gap because when MSMEs transform raw materials into quality products, they can sell at premium prices and reach international markets. “President Duterte wants to make the MSMEs smarter and bigger, not just in number, but also in terms of contribution to the economy. It’s easy to become an entrepreneur—but to have high quality, differentiated products is the real challenge, but it is their ticket to greater success and better quality life,” added Sec. Lopez. • Go Lokal!, a project that discovers and improves MSME products and helps them reach mainstream markets. DTI also developed the Inclusive, Innovation-led, Industrial strategy (i3s)—wherein the academe, industry, and government sectors collaborate to solve business innovation challenges. • Packaging and Labeling assistance.